So recently I was lucky enough to win this pretty Dessata Detangling Bright Brush Duo in Bronze, thanks to a giveaway at Candy Fairy. 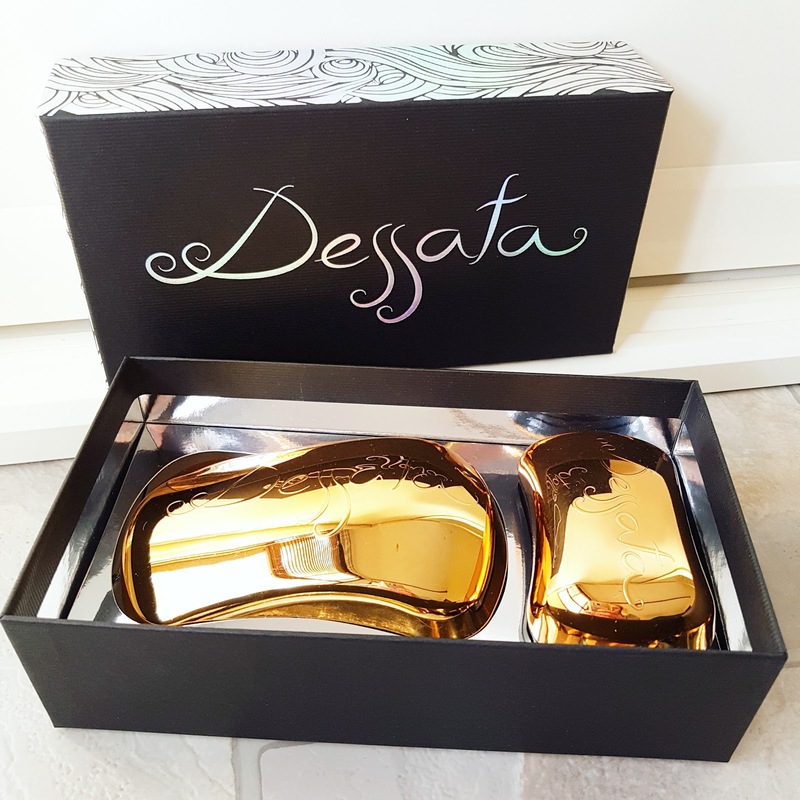 I had been pondering the acquisition of a new brush type product for a little while given the feral state of my current brush and had heard of Dessata's amazing detangling properties on many a beauty blog prior, so I was pretty pleased to win this prize! My weave isn't too bad when it comes to knots, unless I've had it backcombed or curled professionally but I am still mindful of breakage, especially in my current blonde state. This pack comes with a regular size and a mini / travel size with cap which is perfect for the gym (HAHAHAH LOLS) or a daughter with knot-prone hair who hates having her hair done. 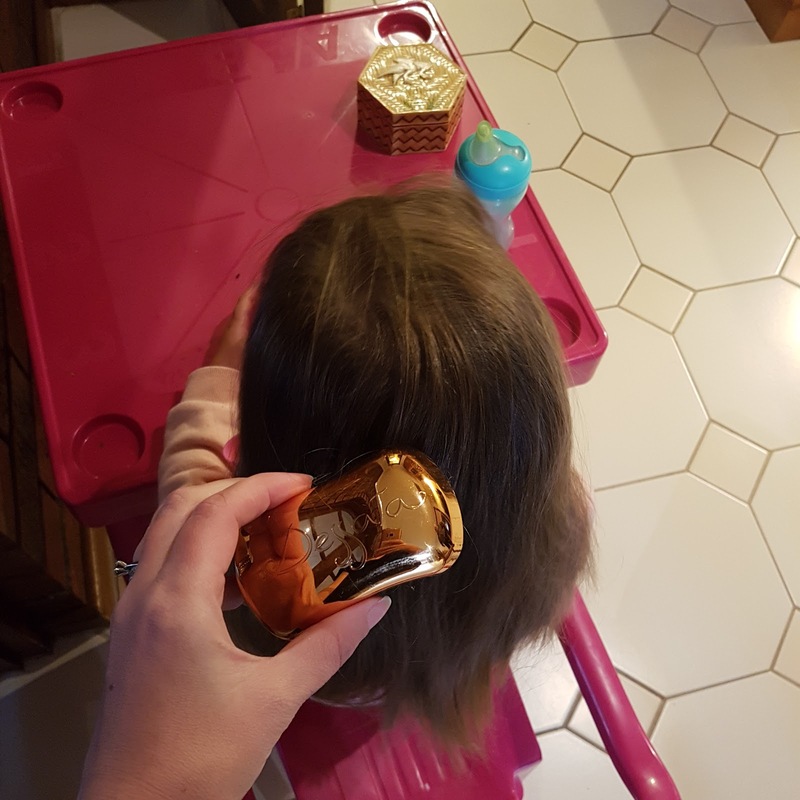 The jazzy appearance of the Dessata Mini was enough to catch her interest and now she even likes brushing her hair herself. Hey, if I can get stakeholder engagement in the process, I'm down for the extra time it takes. A few spritzes of Davroe Tame Detangler (gifted at the Adelaide Bloggers United event) and her wild weave is tamed into one of the four hair styles I offer; piggy tails, ponytail, half pony or bun. The adult sized brush also glides smoothly through hair and doesn't tug or pull, with the curved shape fitting easily into one's hand. I imagine this would be a great gift for someone who had arthritic hands or joint immobility as it doesn't require the tight grip of a conventional brush handle. The bristles are soft and flexible, suitable for all types of hair including fine and brittle and treated with a special coating that doesn't cause static. It's also very easy to keep clean. Mega wins all round. Have you used a Dessata brush before? Is it something you'd like to try? As mentioned, I won this gift set in a giveaway and chose to blog about it. For more information on this kind of thing, please see my PR and Media policy.